A Ryan Pennery hat-trick helped Gosport to an entertaining 6-3 win at home to Met Police on an afternoon of goals at Privett Park. 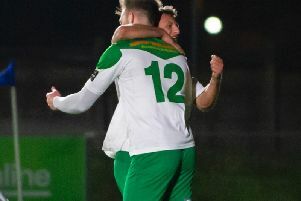 Borough started the day 14th in the Southern League premier south division after winning two of their opening five games, with Met Police three places and two points ahead of them. The hosts got off to the worst possible start, going one down after just three minutes. The Met’s John GILBERT was brought down outside the box and got up to put a lovely free-kick over the wall and in. Gosport drew level on 15 minutes when Pat SURACI raced clear and smashed an excellent finish past the Met keeper. The Met regained the lead when Gilbert and Ethan Chislett helped set up Max BLACKMORE to head them 2-1 in front. But Gosport wouldn’t lie down and Ryan PENNERY levelled a minute later and then put his team 3-2 up from the penalty spot eight minutes later. It was breathless stuff in the late-summer sun at Privett Park and the first-half scoring was completed by SURACI, scoring his second of the day bending home a free0kick to make it 4-2 at the break. The second half continued in much the same vein. PENNERY completed his hat-trick when he put Boro 5-2 up from the penalty spot, then Gilbert scored his second of the match to make it 5-3 – and few present thought that was the end of the scoring. Sure enough, Gosport got a sixth, the ninth goal of the afternoon, and it was another superbly taken free-kick that restored Borough’s three-goal advantage as Matt TUBBS converted. The three points lift Gosport into the top half.​​​​​​​​​​​​​​​​​​​​​​​​​​​​​​​​​​​​​​​​​​​​​​​​​​​​​​​​​​​​​​​​​​of the table.